DHAKA, Oct. 21 (Xinhua) -- China's electricity meter giant Hexing Sunday signed a joint venture pact with a state-owned Bangladeshi firm to develop a new company in the country's southern Khulna region to produce smart prepaid meters. 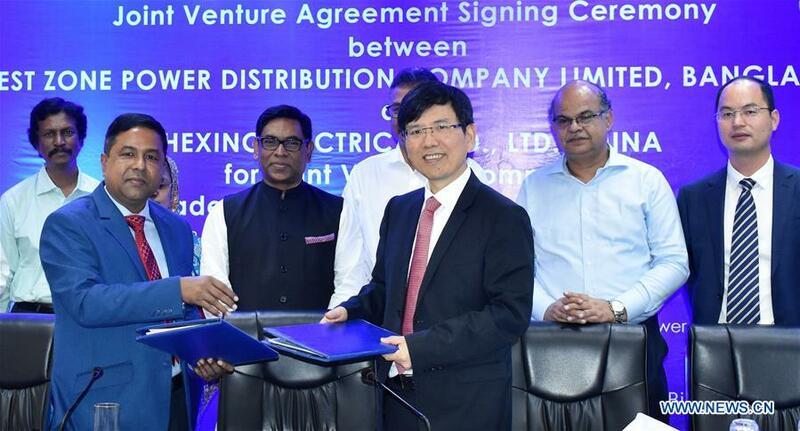 Officials of the Bangladeshi state-owned West Zone Power Distribution Company (WZPDCL) and Chinese Hexing Electrical Company Limited signed the joint venture deal to develop the new company namely "Bangladesh Smart Electrical Company Limited". Bangladeshi State Minister for Power and Energy Nasrul Hamid, among others, witnessed the signing ceremony. Abdul Motaleb, company secretary of WZPDCL, and Zhou Liangzhang, chairman of Hexing Electrical Company Limited, signed the deal on behalf of their respective sides to develop the factory.